I for one am tired about hearing about broken public schools. Are they perfect, of course not. Neither is any other human institution. But what really disturbs me is that the people who want to “fix” public education have the worst ideas ever. They want to make schools more like business and hire head-hunters (superintendents) to fire the bad employees (teachers). Then the head-hunters move on to work for Fox news or some think tank. These people do not truly care about children but about money. Therefore their goals are to get rid of the evil unions that protect teachers’ benefits so they can hire cheaper teachers (outsource them just like the manufacturing industry in this country). Standardization measured by tests is the magic cure! The problem is that schools are not factories and should not be treated like them. And most importantly students are not widgets that can be taught by anyone using the same script. These reforms disrespect both teachers and students by treating them as all the same. Just put the student in the proper machine (program) and out they pop at the end- educated (able to pass standardized tests). But students need relationships to grow and learn. Schools should be more like families than factories. I think real reform starts by going backwards to a “classic” liberal arts education. 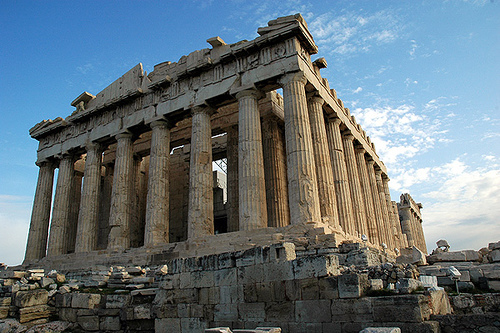 In Ancient Greece students were discipled by the master as part of a community. Relationships were an important part of education. They learned by asking questions. They studied logic, poetry, geometry, and exercised all as one experience. They were not divided by age and subjects were not compartmentalized. There was not classwork and homework. All of life was learning, one integrated experience. Students today need to be given time to think, deeply. They need to play, ask questions, discover, solve real problems, and discuss. They do not need to memorize facts for tests. They need to think critically from multiple points of view. Students need to be given choice in what to learn and how to do it. Schools need more individualization and less standardization. What can we learn from the Ancients? That living is learning and relationships matter. We need less federal bureaucracy and more local control. We need schools that look different because the communities they serve are unique. If we truly teach students to think and learn on their own and in community with each other they will do amazing things. We need science, math, and arts all mixed together. I believe that we should give students freedom to be creative and to engage in ideas with each other. We should scrap textbooks (this form of standardization has dominated even longer than the state and national tests). We should teach from real world problems and current events (we have plenty of them to choose from). Students should engage in real questions and work for real solutions. We should use hammers, nails, wood, computers, dirt, flowers, paper, cell phones, microscopes, cameras, and animals. Students should perform labs where the teacher does not know the answer. Students should study current events and then research the history to understand why things are as they are now. Students should use math to calculate solutions to world poverty, lack of clean water, and adequate food. So what is the role of the teacher in all of this? To guide the learner and challenge them with new ideas and experiences. Most students are not self-motivate learners by themselves (because schools have bored this out of them); they will need mentors and guides to show them how to learn and to challenge them with new ideas. Master learners (teachers) should create fascinating learning opportunities as starting points and then encourage students as they pursue deeper concepts. Too many teachers use curriculum, standards, and textbooks as a crutch and rarely present students with authentic learning. Real reform happens when we abandon the pre-packaged education being sold by textbook companies and start the adventure of giving students great learning experiences. So what’s your excuse? Reject standardization now. You may not be able to change the structure of your school schedule or the the architecture of the building, but you can change the way your classroom works. Don’t know how to start? Start by talking to your students. Find out where their interests are and build from there. Start by talking about the news and the issues in the world. Ask students what they can do about it. Put away the textbooks and engage with your learners. You might be surprised by where you end up. This entry was posted in authentic learning, blog4reform, edreform, standardization on November 21, 2010 by Michael Kaechele.